We're counting down the days Bush is out of office. But not counting on history books to accurately encapsulate the past administration's mistakes of the past 8 years. George Bush Sings is the truth serum time capsule put to a rhythmic beat and the clean-up list for the new president to tackle in office. Election day is almost over. And Writer-Producer-Musician-Environmental Activist, Jon Hartmann, has already completed his Time Capsule Truth Serum CD GEORGE BUSH SINGS as a guideline to help the next President. This 14-track political funk-n-roll series of truth serum tunes is devoted to the proposition that all people are created equal and large corporations tend to abuse the political system. Two disastrous Bush administrations plus one year of well orchestrated music production equal this collection of George W. Bush speeches, edited to speak the truth highlighted by the back beat rhythm of brilliantly arranged instrumental bed fusion of groovy jazz, reggae, funk, world/pop and eclectic rock all in one. 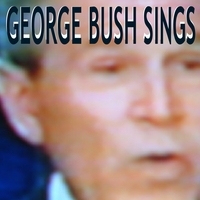 GEORGE BUSH SINGS is available at CDBaby.com/jonhartmann5. "Whoever gets appointed or elected to the highest office will face a massive list of mistakes that need immediate attention. Very few of the actions taken by the Bush administration were a success, but the greatest blunder was starting an unnecessary war. Getting troops out with honor now. The U.N. was designed to intervene in exactly this type of situation. The next President needs to craft a statement explaining that the U.S. cannot solve the hatred and ignorance practiced by lunatics, and that the religious leaders of the sects must expel and renounce any act of violence. As soon as the terrorists are deprived of the cloak and protection of their religion, they will be seen simply as insane murderers, states Hartmann. Hartmann is more than just an accomplished musician, audio engineer and keyboardist. He is an activist who takes responsibility for having a voice within his music creations both politically angled and environmentally angles to align with his stance on important matters. Hartmann's last album, "Pacific Electric," pays tribute to Los Angeles' long-lost Pacific Electric Railway and Hartmann's thoughts of energy, policy and interest of expanding rail service between and inside cities to promote healthier air and trying to understand the removal of the Pacific Electric Railway. His previous albums, "3 if By Air" and "The 10th House" both featured CD cover graphics which reflect Hartmann's passionate visual statement about the fragile nature of the orb we populate. He feels fossil fuels have no place in our future. "If we continue to burn them at the current rate, two things will happen as sure as night follows day.....our economy will be disrupted beyond repair, and our planet, likewise, may be damaged sufficiently to induce global catastrophe," states Hartmann. Hartmann is very passionate about the environment. And has a network of 958 friends on Myspace.com/georgebushsings who are also aware that global warming is more than just some catch phrase and is mindful that the next President of the United States must also address this issue. "The other issue requiring attention is energy and mobility. If we can get people to the Moon, we can find a renewable liquid fuel, while designing propulsion systems that offer flexibility and de-centralization. One of Bush's favorite causes was the elimination of Amtrak, as if passenger rail was already getting too much money to survive attacks by the freight railroads and the oil lobby. Since the GOP has put so much energy toward the elimination of the middle class, the next President must address taxation and equity. Half of the time, the next President will be spending his energies on fixing the mess left by the world's biggest jerk," states Hartmann whose views are echoed by his fans and supporters. Hartmann is a songwriter, musician, producer, music publisher and record label executive whose career has encompassed touring the world. From his first overseas gig in Southeast Asia to entertain soldiers for the USO, to performing with Ike & Tina Turner in Germany with the Rolling Stones as audience spectators. Jon was signed as a writer in 1975 for Peacock Music, where he and Jimmy Whitney co-wrote "Goodness Knows," recorded that year by Michael Jackson. His successful career also includes performing with Dee Dee Bridgewater, the Staple Singers, Sal Marquez, Phil Chen, Cathy Segal-Garcia, Jaye P. Morgan, Morey Amsterdam, Barry Zweig, Arthur Lyman, Bobby Womack, Eartha Kitt and many others. He's currently producing his own works and others on his own independent label, Jon Hartmann Records.